Arrival to the Airport. Meet & greet with group guide and driver who will give you a warm welcome to Costa Rica. Private transfer to your hotel. Breakfast at hotel. After breakfast, take your private transportation to Arenal. One of Costa Rica's most notable natural features is the Arenal Volcano. This impressive volcano resides within the 29,960-acre Arenal Volcano National Park. Although the volcano entered into a resting phase in 2010, it is still a stunning sight. Rising above the rainforest that surrounds its base, Arenal frames the skyline with near perfect symmetry. 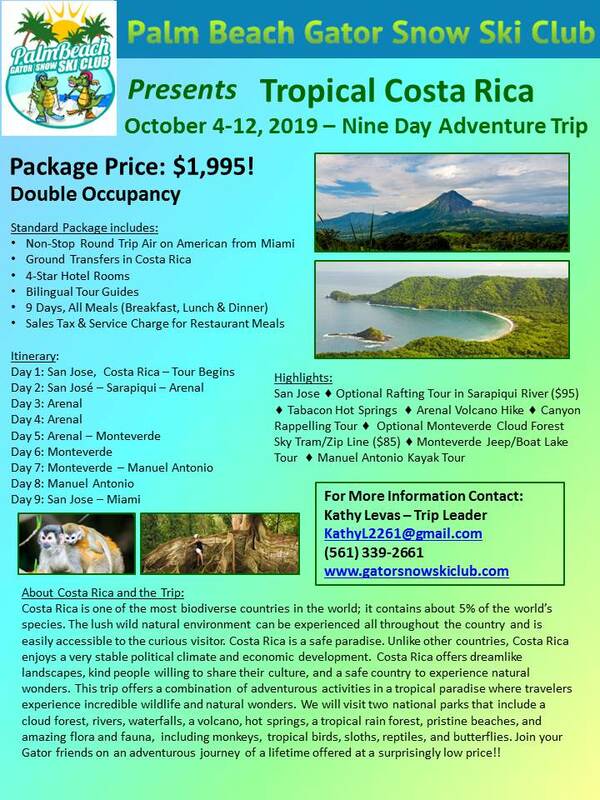 Arenal Volcano Hike: this tour offers an unforgettable hiking experience through trails marked with the remains of previous lava flows of the impressive and majestic Arenal Volcano. The main attraction of La Fortuna is the Arenal Volcano with its nearly perfect cone shape, and a height of 1633 meters. Along the hike you will discover the abundant flora and some fauna which inhabits the a rainforest under re-generation; your guide will tell you all about the Arenal Volcano history and activity. After the hike on this popular volcano we will continue our journey to La Fortuna Waterfall a beautiful place with a lot of vegetation around it, once there we will hike down (500 steps with some resting areas) to the waterfall base to go for a swim on the cool pristine waters of La Fortuna river, after all this exercise you will be hungry so we will take to a nice restaurant nearby to enjoy a delicious lunch. At afternoon, relax every muscle at Tabacon Hot Springs. This waters are naturally heated by the Arenal Volcano, it is pure and without any kind of added chemicals. This water contains all of the original minerals of the hot spring, around thirteen different ones, including calcium, magnesium and bicarbonates. To boost the water’s beneficial properties, our attractions count with focused hydromassage for different body muscle groups. Enjoy a dinner after this relaxation moment. At night, transfer to hotel to recharge for nex adventure day! Breakfast at hotel. Spend your morning make Canyoning Tour. This experience includes 4 Rappels (3 waterfalls and 1 rock wall), Monkey Drop (zip line and rappel) and a Rock Climb in a beautiful rain forest slot canyon. This tour is for young & old and everything in between! Pure Trek Canyoning is the leader in Waterfall Rappelling in Costa Rica! Come enjoy this fun tour with great guides, spectacular views and beautiful trails throughout! From children to adults and people with experience, you will have a blast! After the tour enjoy a delicious lunch. At morning take private transportation to next destination on your trip: Monteverde by jeep-boat-jeep transportation. This is a unique combination of ground and water transportation used as a shortcut between La Fortuna – Arenal Volcano and Monteverde or vice versa. Faster than driving all the way around the lake, the Jeep-Boat-Jeep takes you across the lake in comfortable, covered motor boats. This allows you to enjoy the very scenic landscape at a relaxed pace. Sky tram: will take you up to the highest mountain in Monteverde. This tramway will offer amazing views of the surrounding forests and even more. While ascending you will also be able to admire distinctive flora and fauna that might be only spotted from above. Sky Trek: Get your heart pounding by taking a zipline ride through the Costa Rican forest canopy; whizz along cables slung between canyons, admire incredible views, fly over and in between trees to feel an adrenaline rush like no other. Morning transfer to Manuel Antonio and to enjoy hotel facilities. Manuel Antonio is an small oceanside village with plenty of great places to stay. Famous for its national park, this tiny yet bustling town is located off Costa Rica's central Pacific coast just a stone's throw away from Quepos. The region is a treasure for biodiversity, attracting nature buffs, eco-travelers and adventure-seekers alike. Better yet, if you visit, you can soak up white sand and perfect waters. In the afternoon visit Manuel Antonio National Park: Explore the pristine natural beauty of this world famous national park filled with exotic wildlife such as monkeys, sloths, birds, reptiles and butterflies. Your picturesque 2-mile hike will take you to one of the beaches named most beautiful in the world by Forbes magazine. Experience the lush rainforest behind you, white sandy beaches below, and crystallineblue waters. Breakfast at hotel. Enjoy an adrenaline tour in this morning. Paddle your kayak for a little over an hour navigating past tiny islands and observing marine birds and their nesting grounds. Biesanz Bay, a hidden beautiful inlet where you can rest, enjoy a snack and snorkel. The 30-minute stop will allow you to explore the coastline. Water’s visibility will vary depending on the season, and there will be opportunities to spot parrotfish, starfish, angelfish and maybe even a sea turtle. Afternoon at leisure to enjoy hotel facilities or relax at the beach. Register online and reserve your spot now with only $500 deposit. If you register online, please fill out the hard copy application and send it to the with your deposit check and a copy of your passport to the trip leader at the address listed below. If two applications are sent together, please send a copy of each person's passport. If you would rather not register online, you can download, print and mail the hardcopy trip application. After your deposit is received, you will get an invoice (s) from the Club. Please send all payments to the trip leader, Kathy Levas at the address listed above. It is highly advisable to purchase trip insurance for any international trip. You will need to apply and purchase your own trip insurance, which is not included or offered by the Club. Obtaining trip insurance is voluntary, entirely up to you. As a guidance, we suggest you visit www.insuremytrip.com and choose a comprehensive plan, that covers trip cancellation, medical, trip delays, evacuation, etc and has 24 hour assist hot line. Keep track of the little footnote that says “secondary”. That means that you are expected to have a primary plan and after those benefits are exhausted, your secondary kicks in. If you have a chronic condition, pay attention to the ”pre-existing” waiver provisions.